From the time we started reviewing apps, New York-based app maker Artgig Apps has been one to follow. Their apps are generally high quality, but our favorites are Mystery Math Town and Mystery Math Museum. These two math-based games are especially notable because of the clever game design, which sees kids using arithmetic operations to rescue the fireflies in an abandoned city. Combined with a fun narrative, the games have been a hit with our kids. Now, Artgig Apps has taken the same winning formula and applied it to another early learning skill: spelling. The new app is called Mystery Word Town, and is set in a western-style town by the river. We’ve taken it for a spin, and can honestly say that it’s a terrific option to help kids learn spelling words. Trouble is brewing in Mystery Word Town! A group of outlaws, The Huevos Rancheros gang, has stolen the gold and are hiding out. 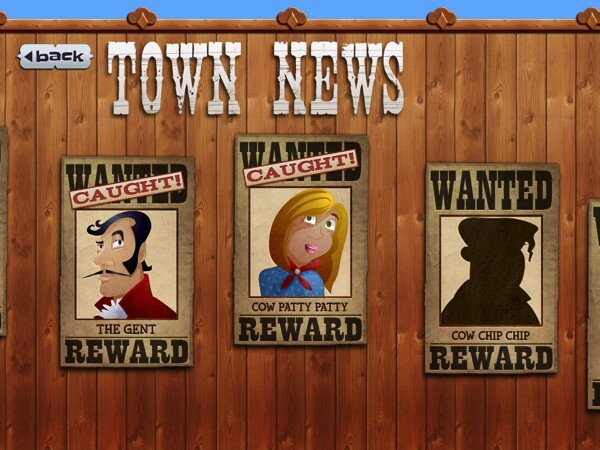 Your task is to help the ghostly Sheriff search all the places in the town to recover the gold and catch the outlaws. Spell words to unlock doors, windows, and passages. Once you’ve found all the gold hidden in the place, you’ll also capture the outlaw hiding there. There are 12 places to search, including the Milk Bar, the circus, and the steamboat. You unlock each place in sequence, starting with the Sheriff’s office. A gold nugget will appear outside the place you need to search; tap on the place to begin. Once you’ve arrived at your destination, you will find letters floating around the screen. Tap on them to save them to your tool belt. You can then use the letters to spell the words that unlock doors and passages. The gold can be hidden anywhere in the building, so be sure to explore all the rooms. A counter on the top right shows you how many gold is hidden in the building, and how many that you have found. As you explore, sometimes you’ll find quirky character portraits hanging on the wall. You can tap on them several times to reveal the game’s backstory and other silly comments. While the game’s premise is simple, some form of strategy can come in handy to breeze through the stages. One thing you need to remember is that your tool belt can only carry so many letters at a time. Often, you’ll find more letters than you can carry, so you have to decide which letters to keep. If necessary, you can remove a letter from your tool belt by tapping on it. If you don’t have a letter you need to spell a word, try exploring other rooms first. It is possible that the letter you need is several rooms away. Another tip is to leave a room and come back later to get new letters. Mystery Word Town is recommended for ages 6-12, and designed to support classroom learning. You can create multiple user accounts in the app, and assign a custom game to each account. The app comes with three levels of difficulty: Level 1 (Easy), Level 2 (Medium), and Level 3 (Hard). You can review the extensive word lists to help you decide which level will be suitable for your child. For reference, a child in Grade Three should be able to tackle the spelling problems in Level 3. You can also set whether the game should play audio hint or not. In audio hint mode, a narrator will read the word and the player must fill in the missing letters. In non-hint mode, the player can fill in any letters that spell a legitimate word. This means that some problems may have several possible answers, for example, D_G can be correctly answered with an O, I, or U.
Update: As of version 1.1, you can add and record your own custom word lists. You can create a new list from scratch, or copy and edit the default word list. In terms of safety, you can rest assured that the app has no ads and in-app purchases. All external links are secured in parents’ section. No Internet connection is required to play. We have come to expect great things from Artgig Apps, and Mystery Word Town doesn’t disappoint. With its immersive gameplay and well-written narrative, the app makes you forget that you are, in fact, learning to spell. The more you explore the town, the more you’ll pick up interesting details that unravel the game’s backstory. You’ll also find fun trivia; in the school building, Ms. Wordsmith’s portrait will tell you how the English language is influenced by other languages such as German and Dutch. As the game gets progressively difficult and the houses get bigger, it is evident that strategic and critical thinking is necessary to win. For example, how do you make sure all rooms have been searched? Which letters should you carry on the tool belt and which should you leave behind? True to its design to support classroom learning, the game has great replay value because you get new words and letters every time you play. This allows kids to really brush up on their spelling and expand their vocabulary. Artgig Apps’ latest offering proves once again that learning happens best through playing. With its blend of clever gameplay and witty narrative, kids are sure to have a blast wrangling any outlaws and spelling challenges that come their way. If your kids loved any of the previous Mystery Town apps, they are sure to love Mystery Word Town. Artgig Apps is the mobile app development arm of Artgig Studio. They are a polished team of creatives and developers, augmented by a super-talented network to handle projects of all sizes. Their portfolio consists of high quality educational math games, many of which have been featured on Geeks With Juniors. Mystery Math Museum is the sequel to Mystery Math Town. It offers the same game mechanics and rewards, but set in eight new museums in the new town. Similar to the prequel, you can customize various math skills to suit each player’s age and ability.